Ideally the farm family was self-sufficient. 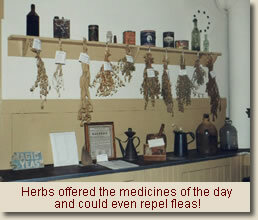 But there were some items that were best provided for by making a purchase at a store. And an opportunity to go to the store was a looked-forward-to adventure for everyone in the farm family. Vintage stores of the 1800s and early 1900s could provide for the needs of the many family members, as T-AHS's 1857 Historic Store reflects. 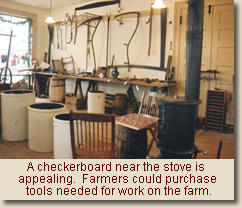 The farmer could purchase needed tools; the farm wife, yard goods; children, penny candy. 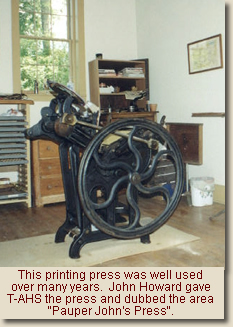 Our 1857 Historic Store even has a 100 year old Clamshell printing press, a medicinal area where bunches of hanging herbs are on display, a checker board set up near the wood-burning stove, and a mail sorter which could be conveniently moved from the Republican store to the Democratic store, according to the political affiliation of the current US President.